The syndrome is named after Edward Treacher Collins (1862–1932), an English surgeon and ophthalmologist, who described its essential traits in 1900. In 1949, Adolphe Franceschetti and David Klein described the same condition on their own observations as mandibulofacial dysostosis. The term mandibulofacial dysostosis was used to describe the clinical features. A 12-year-old female reported to the Department of Oral Medicine and Radiology with the chief complaint of forwardly placed upper anterior teeth. She had a history of operated bilateral cleft lip and palate, which is one of the presenting features of TCS. Family history was insignificant. On extraoral examination, she presented with antimongoloid slanting of the palpebral fissures with sparse eyelashes on the lower eyelid with an inability to close the right eye. There was hypoplasia of the malar prominence [Figure 1]. Micrognathia was also evident. Due to previous surgery for cleft lip and cleft palate (CLCP), the nose tip was pointing downward, upper lip appeared incompetent, and the patient had “bird like” appearance because of premaxilla prognathism. [Figure 1],[Figure 2],[Figure 3]. In addition, she had malformed ear of the right side. Intraoral examination revealed high-arched palate which is a peculiar feature in operated cases of CLCP. The maxillary incisors were proclined with spacing. Missing lower second molar, overretained lower second deciduous molar of the left side, was noted. Overall, oral hygiene was poor due to malocclusion [Figure 4]. Orthopantomogram (OPG) revealed prominent antegonial notch, short ramus [Figure 5], hypoplasia of the mandible, and defect in the premaxilla due to alveolar cleft bilaterally [Figure 6]. 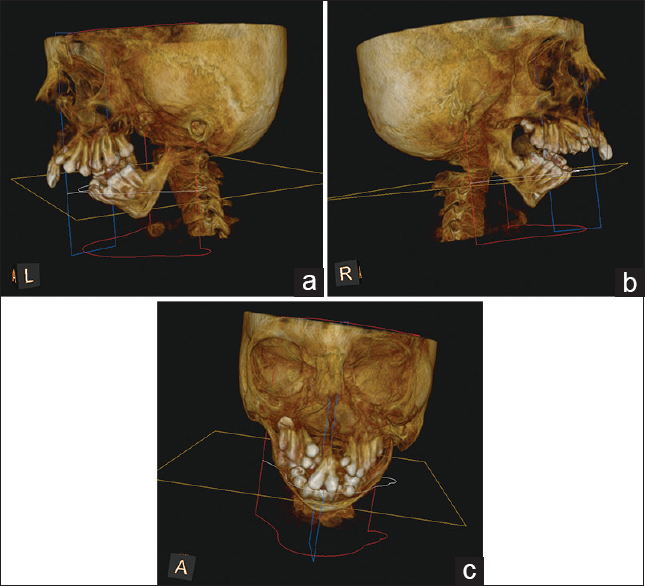 Three-dimensional images show bilateral bony defect of premaxilla. There is proclination of anterior maxilla and crowding of teeth in the same region, and also distally inclined crowns of right and left maxillary central incisors, missing right and left lateral incisors, overretained right deciduous lateral incisor, and impacted right and left maxillary canines. The cone beam computed tomography (CBCT) images give the exact nature, position of the bony defects, and dental deformities present, as compared to OPG. Association at times with other anomalies, such as obliteration of the naso-frontal angle, pits or clefts between the mouth, and ear and skeletal deformities. Obliteration of the nasofrontal angle and cleft was observed in our case. Most of the clinical features in a patient presenting with TCS were found in our case which gives it the merit of a classical case of TCS. In this case, orthodontic treatment in the form of distraction has been initiated after scaling and polishing. Some reports have suggested that multiple major reconstructive surgical procedures in severe form of TCS have shown only marginal improvement and these patients are unlikely to benefit from stem cell therapy. Therefore, future research is directed toward preventive aspects and early prenatal detection of this condition. 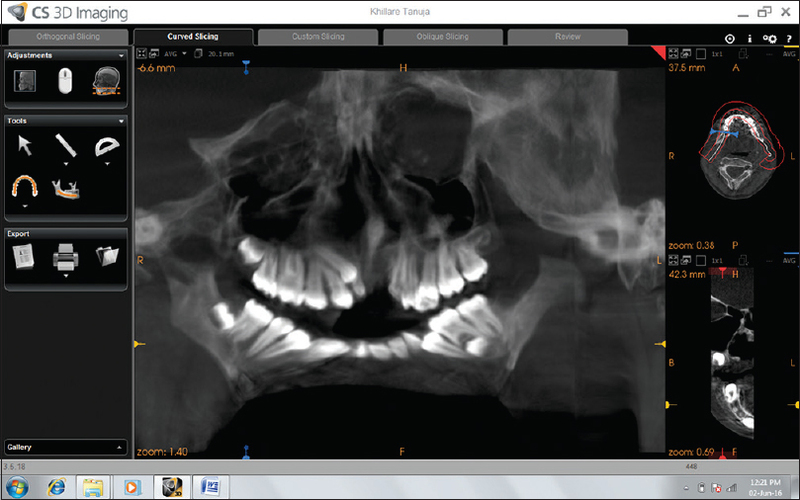 In addition to OPG, CBCT images provide better understanding of facial deformity. Trainor PA, Dixon J, Dixon MJ. Treacher Collins syndrome: Etiology, pathogenesis and prevention. Eur J Hum Genet 2009;17:275-83. Dixon MJ, Read AP, Donnai D, Colley A, Dixon J, Williamson R. The gene for Treacher Collins syndrome maps to the long arm of chromosome 5. Am J Hum Genet 1991;49:17-22. Kasat V, Baldawa R. Treacher Collins syndrome - A case report and review of literature. J Clin Exp Dent. 2011;3 Suppl 1:e395-9. 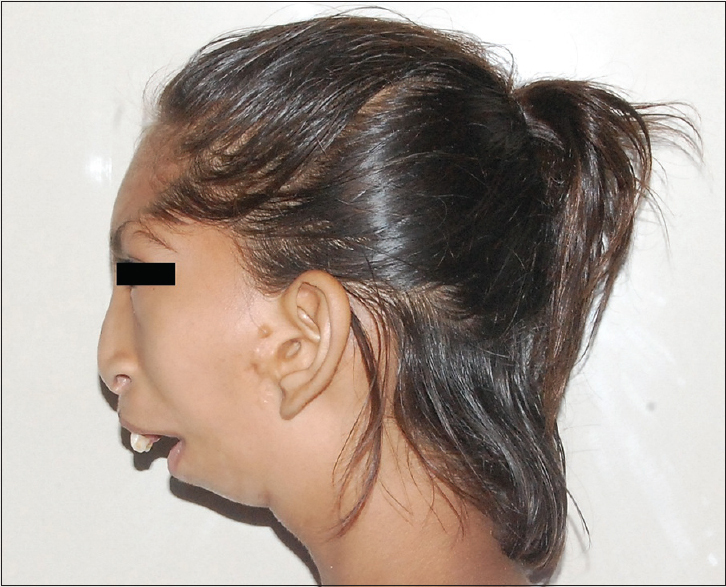 Agrawal SM, Parihar SS, Agrawal MG. Mandibulofacial dysostosis (Treacher Collins syndrome)-A rare case report. Natl J Med Dent Res 2013;1:34-7. Dixon MJ. Treacher Collins syndrome. J Med Genet 1995;32:806-8. Edwards SJ, Gladwin AJ, Dixon MJ. The mutational spectrum in Treacher Collins syndrome reveals a predominance of mutations that create a premature-termination codon. Am J Hum Genet 1997;60:515-24. Hertle RW, Ziylan S, Katowitz JA. Ophthalmic features and visual prognosis in the Treacher-Collins syndrome. Br J Ophthalmol 1993;77:642-5. Farrar JE. Mandibulo-facial dysostosis. A familial study. Br J Ophthalmol 1967;51:132-5. Alva P, Shetty SR, Babu S. Treacher Collins syndrome - A report of two cases and review of literature. J Clin Exp Dent 2011;3 Suppl 1:e395-9.